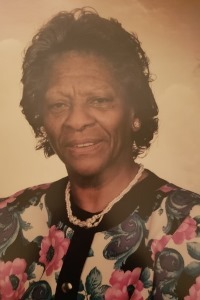 Keziah “MaDea” Adams, 99, of Chattanooga, transitioned to her heavenly home on Tuesday, December 18, 2018. Mrs. Adams was a faithful member of Greater Saint John Baptist Church. She later attended Pneuma Christian Center. She was preceded in death by her daughter, Frances Adams; sister, Bernice Lewis; brothers, Harry, Leo, and Edward Gunn. Survivors include her daughters, Willie Knox and Katherine Davis; sons, Richard Adams and Al Adams; sisters, Claire Bell King and Lucy Mae Jones; 12 grandchildren; 22 great-grandchildren; six great-great-grandchildren; and a host of other relatives and friends. She will lie-in-state on Friday, Dec. 21, after 12:30 p.m. at Taylor Funeral Home. Burial will be on Saturday, Dec. 22, at 11 a.m. in Greenwood Cemetery. Funeral services will follow at 12:30 p.m. at Pneuma Christian Center with Dr. R.J. McCowan as the eulogist.